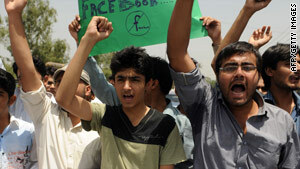 Last month, "Everybody Draw Muhammed Day" drew protests from students in Lahore. Islamabad, Pakistan (CNN) -- A Pakistani court has ruled that the government can unblock Facebook if the Pakistan Telecommunication Authority takes measures to block any objectionable material on the social networking site, a lawyer involved in the case said. Chaudhary Zulfiqar Ali, a lawyer representing the Islamic Lawyers Movement, which initially petitioned the court to block Facebook, said the next hearing for the case will be June 15. On that day, the Pakistan Telecommunication Authority will explain to the court how it plans to block objectionable material on Facebook and other websites. An official from the Pakistan Telecommunication Authority said that Facebook will be unblocked immediately after the court delivers a written order. Pakistan blocked the site May 19 in response to an online group that called on people to draw depictions of the Prophet Mohammed, officials said Wednesday. Drawing depictions of the prophet is forbidden to followers of Islam; devout Muslims consider such depictions offensive. The Telecommunication Authority issued the order a day before "Everybody Draw Mohammed Day," scheduled by a Facebook group with the same name, because of "the objectionable material" on the site, said Khoram Ali Mehran of the Telecommunication Authority. Meanwhile, nearby Bangladesh also blocked access to Facebook over the weekend, after government officials said satirical cartoons of the prophet and the country's leaders were uploaded.